The app tends to work well for diamond customers but here is my review for the online experience. This is second time I’ve had problems with the mobile app. 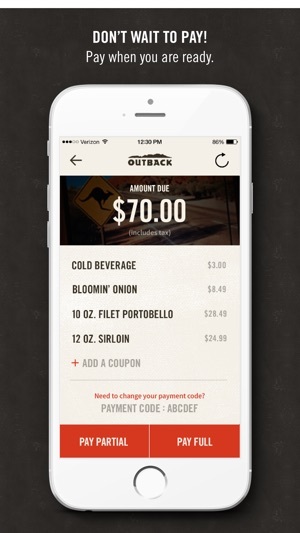 The application (app) takes the customer online to place an order. After taking the time to click everything you want and hit the place order button, an error appears telling me to call the restaurant. The problem here is the wasted time. If the application is not working, than don’t let me order. I thought the point of having an app was to make ordering fast and easy. Not having to navigate through the steps only to be told there was an error. Please fix or improve the experience. 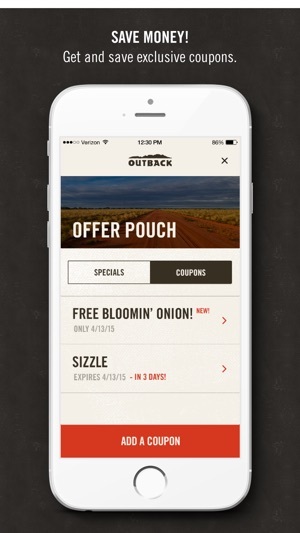 I would also like to point out that the mobile app IS online ordering. The mobile app actually takes you to the internet to place the order rather than allowing you to use it. It’s basically a waste of everyone’s time to make it seem as if the app does anything more than send you to the internet to do anything in the first place. This app is useless and has been for years. It will not allow carryout orders to be placed in my area - a major metropolitan area north of Baltimore. It shunts you out to the regular website. The regular website is just as annoying, and also has been for years, because it oscillated back and forth between letting you have an account and making you enter all your account info (including your car info for pick up) every freaking time you place an order. 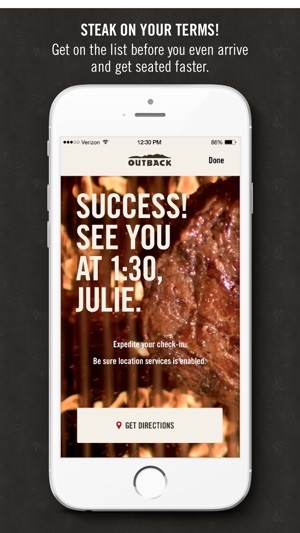 We like Outback food, but having to enter all the information, and not being able to do repeat order (like my little dinky pizza shop across the street can!) is infuriating. For a national chain, it is really pathetic and sad that they can’t get a simple mobile commerce service right. I’ve been making these same comments for years, no change. What really burns is that after entering all your personal and order information each time, the website asks you about your experience. One of the questions is something like “if you had not been able to use our online ordering service, what would you have done?” This possible responses include things like “gone somewhere else,” “ordered by phone,” “gone for table service,” etc. I guess not enough people are saying they’ll eat somewhere else, so they don’t bother to change a thing. So much unnecessary hassle for what should be a very simple fix. In a server and host point of view, thank god for this app. It helps so much. I love when the customers come in and say they used the app. You can get their number and use that to page them. They can go to their cars and not crowed the host stand when it’s busy. In a servers point of view, I love when my customers pay on the app. That’s one more trip I do not have to make and that trip was saved for another customer of mine. Although, it is scary because you never know if they actually did pay on the app and you have to race to the posi to make sure they did 😂 I absolutely love this app. © 2018 Outback Steakhouse of Florida, LLC. All Rights Reserved.